So the new season was upon us. New faces, old faces and reoccurring older faces joined hither for the inaugural week 1 bounty game for season 21 at the New Talbot in West Bromwich. Tod was reigning champion, but there would be a fresh collective of players all vying to take his beloved title. Who would draw first blood in the bounty game? We were to soon find out! None of course, first game innit?! 31 players made it for the first game and this would ensure that for the first time ever there was an alternates list. Ricky Buckland would be the player to go down in history as the first ever BCPC alternate, yay! The cards were out in force on the first hand! Mooch reporting quad 10’s! Who shuffled these cards?! Nye made a good fold against McKinley, rivering the set but with 4 diamonds just had to lay it down. Unlucky Nye! Now it was Ty Godwin’s turn. His all in preflop with pocket 5’s managing to hit a straight up against A Q. We hadn’t even hit 20:00 yet and Mark England was already struggling. Pocket Jacks not being the hand of the night as Nye manages to river the flush. A few happy campers from the game’s events! Mark England was thrown a lifeline. He shoves his solitary 500 chip in to the mix and receives two callers pre. He turns pocket rockets and receives a triple up for his efforts. It ain’t over until the fat lady sings! Cromwell was getting excited and tried to contain it as he hit Quad 6’s off the flippy flop. Heads up Ty Godwin was betting in to him and shoved which would mean an early bath for Godwin and a bounty coming Cromwell’s way. Mooch meanwhile was busy taking out Yvonne in her first BCPC game. All in on the turn with a 10 high board her pocket Kings couldn’t live up to Mooch’s bullets. Nice hand Mooch and unlucky Yvonne! Ricky would be next to leave us not before Courtney and his round of applause. His pocket Jacks cracked by Nye’s A/10, Buckland not happy! You think flopped quad 6’s were good? Well take a look at this beauty! Nye stepping it up a level and taking a High hand to boot! Charles Mason puts Nye all in with the flush draw but that was no worry to Nye. Very nice hand sir. What does Quad Aces do to you Nye? He would pick up around £120 for that little beauty, nice one! Blinds were now all to 150/300 with a 300 dealer ante and Tony Trippier was being dealt pocket rockets. This time however it wasn’t meant to be getting them cracked by Rhoden’s JQ to hit the straight with one card. Unlucky Tone! Dan Ryders takes out Liam. Unlucky for him his trip Jacks Ace kicker no good against the straight of Dan. Nice hand sir! Amy would exit the game in 16th shoving all in pre A 10 and found a caller in Cromwell’s pocket 6’s. Flop 6 Q Q to give Cromwell full house but a Q on the turn meant some squeaky bum time. A brick on the river would mean we were now down to 15. Unlucky Amy. It should have been the final table at 10, but the last hand before getting the table prepped would see Cromwell take Bailey out leaving us with a 9 handed final table. Rhoden would be first to exit with a very short stack called all in preflop against Cromwell. No help and she’d leave us in 9th place. Trev would leave us in 8th place after seeing his K/10 all in called preflop by Cawley’s A Q. No help for either and Cawley’s Ace would carry. Brian gets it all in pre and Cromwell couldn’t resist the chance of a bounty calling the Q 6 with J 10 suited. What should have been Yate’s turned in to a choppy chop as the board paired twice and left an Ace kicker for both to share. Cromwell took a big pot of Cawley hitting a set of 9’s on the flop before making a full house on the turn to increase the chip count. Smithy would put his tournament life on the line with A 8 up against the AQ of Yates. 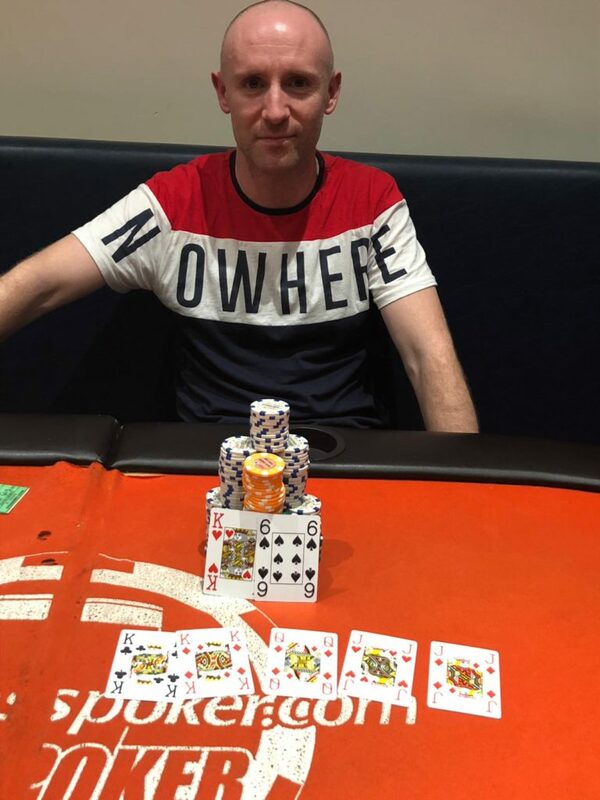 An Ace and a Queen on the flop would seal it for Smithy leaving the fold in 7th place. Tod’s A Q almost takes Cawley out preflop against his A 4 leaving him the short stack. Rich was slow playing Nye and Nye was slow playing Rich. Both with a flush off the turn but it was Nye who held the higher one. Rich would leave us in a respectable 5th place the next hand as a short stack to Nye who had woken up with A Q to Rich’s 5/7 suited. Brian Yates would be next to go courtesy of Cromwell in 4th place. Not content with that bounty Matt and Tod see a flop. Tod shoves with the Ace on the Ace high board, but Matt had one too with a better kicker. Tod would leave us in 3rd. Nye and Cromwell would go heads up after a quick cigarette break and Matt started with a 3:2 chip lead with blinds at 1500/3000. Matt had stolen a few pots earlier before Nye doubled up courtesy of a shove on a lowish board. Another 10 minutes would see not much action with a lot of folds preflop until Nye raises up to 7500 with A/10. Cromwell would call with K/6 to see a flop of K K Q. Matt, thinking he was good checks behind Nye and a Jack dropped. Cromwell thinks it’s possible Nye has A 10 and Nye shoved. Cromwell couldn’t fold his trips however and the call was made with the cards being turned over. Nye looked very good until that fateful 2nd Jack dropped to pair the board and that would mean that Cromwell had found his first BCPC win courtesy of a full house! Unlucky Nye, very well played! Remember to check out the calendar of upcoming games and events. Big thanks Tod for spreadsheet data and Brian for newsletter. Remember to keep getting your pictures in the WhatsApp group for blog input thanks.